What if Tesla Motors were to be the winner in the market share battle over DC Fast Charging services? Electric car owners are pawns in a battle between automakers on DC Fast Charging protocols and services. 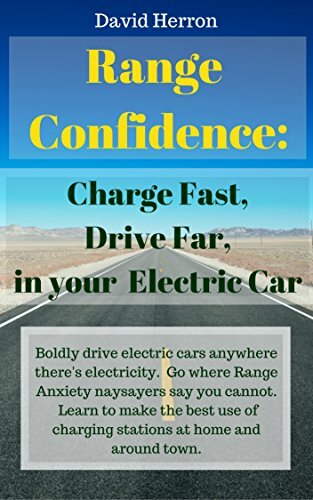 The three (four if you count China) charging standards, CHAdeMO, Combo Charging System, and Tesla’s Supercharger, are mutually exclusive methods for quickly charging electric cars. By having three competing standards we all suffer from a fragmented charging network and the inability to simply drive up to any fast charging station and use it. All of us would be well-served if the automakers would get out of this ridiculous competition and work together on a common standard. But maybe Tesla Motors has a route to where they could tweak the Supercharger network so that any Combo Charging System vehicle could use it. Attached below is a video from Switzerland showing the first non-Tesla Supercharger station. 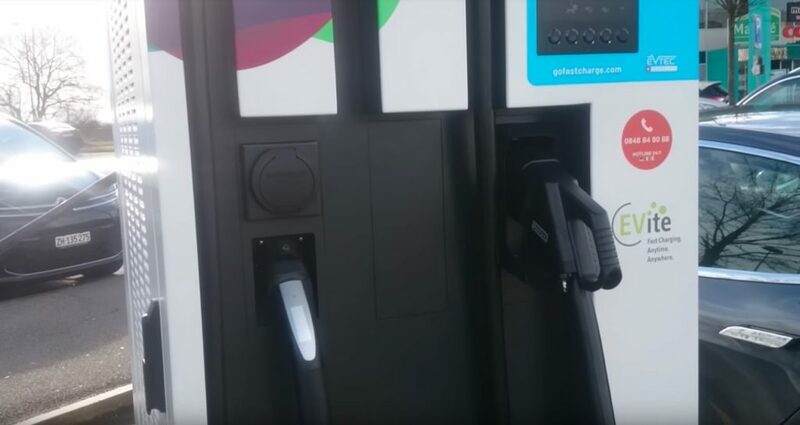 What that means is a regular charging network (EVite in Switzerland ) has implemented a Tesla-compatible plug on one of their DC Fast Charging stations. Which in turn means there’s a glimmer of hope that regular charging networks will start to offer all charging protocols, and not just CHAdeMO and CCS. It’s also the first solid evidence of cooperation between Tesla and other companies on fast charging infrastructure development. 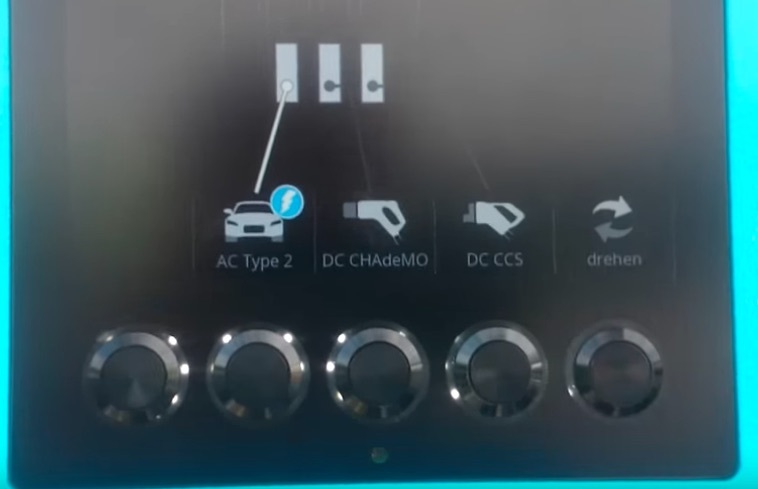 The video shows an EVite multi-protocol DC charging station offering not only CHAdeMO and Combo Charging System, but “DC Type 2” charging. 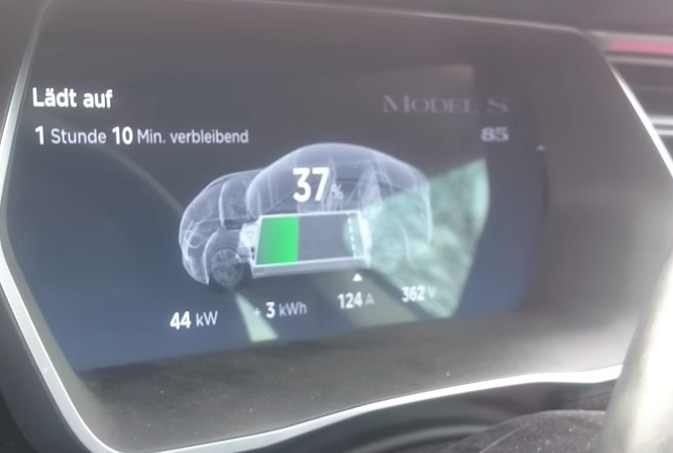 A Tesla Model S owner is shown using the DC Type 2 cord to fast charge his car, but only to be disappointed at a paltry 44 kiloWatt charging speed while the real Supercharger facility a few kilometers away offers a full 120 kiloWatt charging speed. The station in question is manufactured by EVTEC. 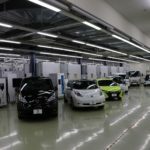 They make a station I’ve discussed earlier, offering scalable power delivery up to 150 kiloWatts per station depending on how many charging cords are in use, and the ability of each car to receive power. At the time I enthused about how that station could be used to implement the equivalent to the Tesla Supercharger network but owned by a company other than Tesla Motors. The user selects the charging type to use with these buttons. 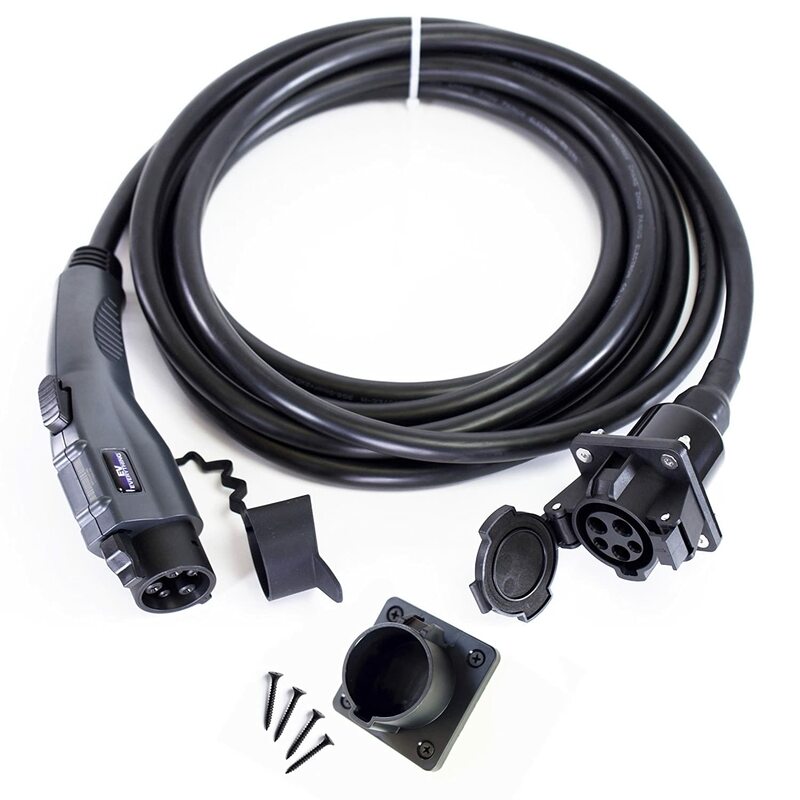 Shown here is regular AC charging, CHAdeMO and Combo Charging System. 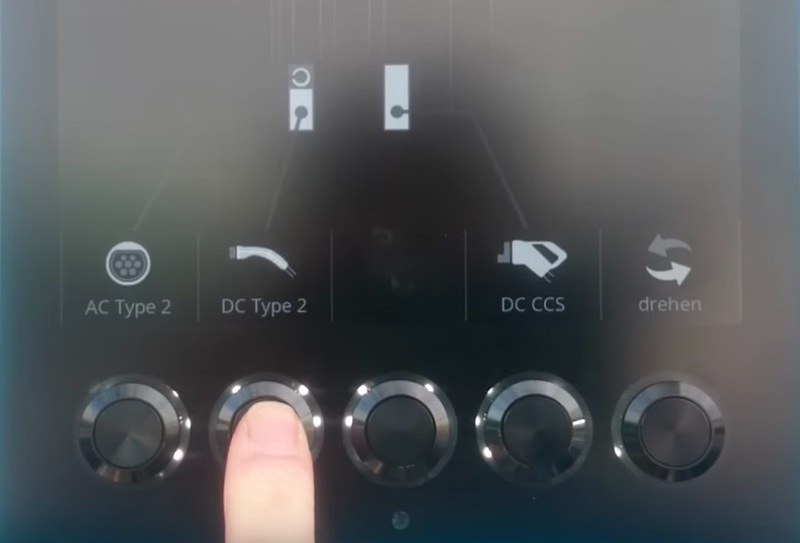 The Tesla charging port requires DC Type 2, which is selectable here. You tap the “drehen” button to show these other charging modes, then tap “DC Type 2” as shown. As the video starts, the charging station is in use by a Renault ZOE driver. That car supports AC fast charging, 3-phase at a 44 kiloWatt charging rate. The Model S owner says he wants to wait until the station is unoccupied before starting his charging session. His reason is that the EVTEC charging station allocates power based on the number of charging ports in use. Presumably he wanted to see if the non-Tesla Supercharger would charge his car at a high enough rate to be worthwhile. Therefore, if the station were not otherwise occupied, possibly his car would be charged at a high rate – because the station is supposedly capable of delivering up to 150 kiloWatts of power. The other consideration is that the Type 2 cord he needed was in use by that ZOE driver. The result is a 44 kiloWatt charging rate. The driver is clearly disappointed, and he refuses to acknowledge it as “supercharging”. The driver is clearly disappointed from his voice as he says it’s a 44 kiloWatt charging rate, and at a significant per-minute cost. Given that there’s a real Tesla Supercharger station just 7 kilometers away we shouldn’t be surprised that in the next scene he’s getting over 100 kiloWatt charging rate at that Supercharger station. Here’s where we take a step back and ponder – What does this all mean? First off it means that Tesla Motors (in theory) does not have to be the sole provider of fast charging service for Tesla’s cars. This is a practical example that a 3rd party company can now start delivering said service. 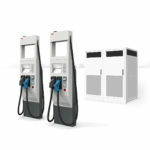 Since the implementation is in EVTEC charging stations, any charging network operator could begin deploying this service by buying equipment from EVTEC. Perhaps other charging station manufacturers will do the same and offer Tesla-compatible DC fast charging. 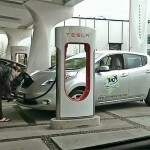 No Tesla logo is on the charging station, instead it is described as “DC Type 2”. Couldn’t the other car manufacturers then also adopt DC Type 2 for fast charging? Tesla Motors has offered to the automakers access to the Supercharger network – if those automakers would pony up cash to help pay for the network. It’s my opinion the automakers would not want to do so because of marketing and branding – by utilizing Tesla’s network the automakers would bolster Tesla’s market position and degrade their own. But, an automaker could certainly adopt “DC Type 2” because it doesn’t carry any Tesla logo and therefore doesn’t bolster Tesla’s market position. In Europe, the Combo Charging System connector is the Type 2 plug but with two extra pins for the DC power. It’s the same trick used in the USA, where DC fast charging is a regular J1772 plug with two extra pins attached for the DC power. 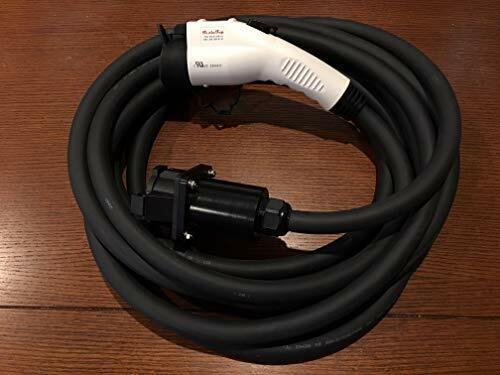 But, Tesla Motors has proved that DC Fast Charging at 130 kiloWatts is possible through a regular Type 2 connector. 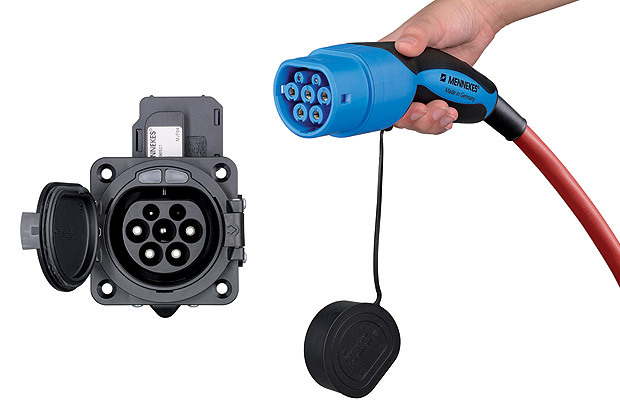 Begging the question of why the other automakers had to use a different plug for DC fast charging than the regular Type 2 connector. In other words, if the other automakers were to adopt DC Type 2 for fast charging, some interesting options open up. Obviously as demonstrated here, charging network operators can start offering DC fast charging for Tesla cars, getting into competition with Tesla Motors on charging services. But more importantly, Tesla Motors could start offering generic DC Type 2 charging for non-Tesla electric cars. Consider that two years ago Tesla Motors joined the CharIN alliance. 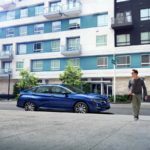 This alliance is all about promoting the Combo Charging System, developing the 150 kiloWatt version of that standard, and perhaps pushing it to 350 kiloWatts. Theoretically that means Tesla Motors is supposed to put its weight behind the Combo Charging System, despite offering its proprietary Supercharger network. But..
What if Tesla Motors were to rebrand its service from “proprietary Supercharger network” to “open Combo Charging System over DC Type 2”? If Tesla, Daimler, VW, and other automakers were to all choose this “DC Type 2” concept as the standard for DC Fast Charging (in Europe), how would that look? Adapters: The existing CCS cars would require an adapter to use a DC Type 2 charging station. Since it’s CCS at both sides of the adapter, it should be a simple pass-through adapter with no electronics. One standard: We’d all have a path towards one standard, with CCS winning the market, and Tesla on board with CCS. CHAdeMO’s days would be numbered. 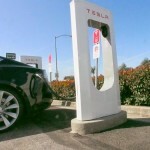 Tesla as dominant charging network provider: Tesla’s Supercharger network could transition to being an open service for any car sporting a DC Type 2 connector. Tesla would need to develop a method to charge owners of non-Tesla cars a fee, not an insurmountable challenge. Tesla could gain quite a lot. Their Supercharger network is very well developed and is a big selling factor for folks to buy Tesla’s cars. Tesla would lose quite a lot by allowing other cars to use their stations, because no longer would the charging network be a unique selling proposition propelling folks towards buying Tesla’s cars. Where Tesla would gain is by being the dominant charging provider simply due to the number of Supercharger stations they’ve installed. At a conference last summer Tesla’s CTO JB Straubel said the company was actively talking with other automakers on figuring out a structure to work with them. There are four potential wins here. First – a demonstration that Tesla cars can DC Fast Charge at a CCS charging station. After a little bit of work by charging station vendors, this could be rolled out pretty widely. Second – non-Tesla cars using CCS could in theory be charged at a Tesla Supercharger station. Tesla would have to develop a fee structure for those car owners, and a mechanism with which to charge those car owners. The other car manufacturers are unlikely to pay money to Tesla for this, so Tesla might end up charging those car owners a steep fee. Third – direct competition between Tesla’s Supercharger network and 3rd party charging for Tesla DC fast charging. Competition is a good thing. Fourth – may we no longer have to worry about which DC fast charging is compatible with our car. Background: What’s a Type 2 connector? “Type 2” refers to the charging connector, which was originally meant to be the European equivalent to the AC J1772 plug used in the USA, Canada and elsewhere. See my Field Guide to Electric Vehicle Service Equipment (EVSE) for details. 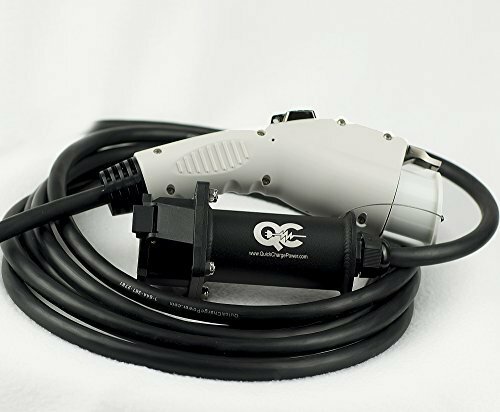 This connector was originally meant for AC Level 2 charging, meaning AC charging at a 6 kiloWatt rate (or more, sometimes). Tesla Motors took that charging connector in a different direction. 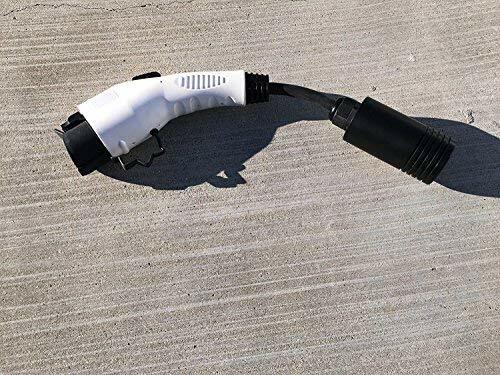 In America, Tesla uses a proprietary charging connector that’s very slim/sleek, and supports AC charging at rates up to 20 kiloWatts, and DC charging at rates up to 130 kiloWatts. 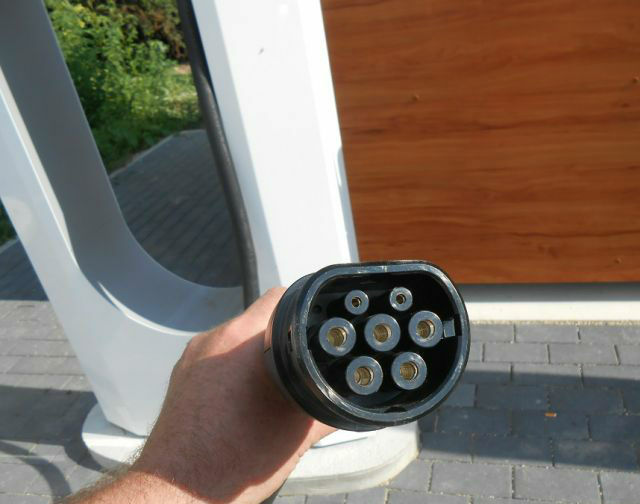 In Europe, Tesla Motors adopted the Type 2 plug shown above, rather than stick with their proprietary plug, and are supporting both AC charging and DC Fast charging through the Type 2 plug. Fast Charging, SAE DC Fast Charge, Supercharger. Bookmark.